The Lafayette Locomotive Service Facility is the major employer in the area. Their service record is so widely recognized that many railroads send their motive power here for maintenance. It's talented work force is well known around the country and can be counted on to resolve locomotive problems quickly. The main entrance to the service facility is at the end of 1st Street. 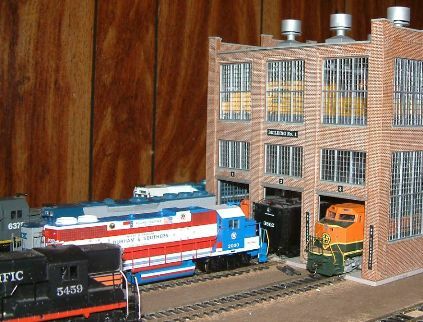 So join us on our tour of the Lafayette Locomotive Service Facility. You'll find our highly qualified staff to be both informative and friendly. Enjoy you visit. This is the overview of the locomotive servicing facility. It has three service bays start at the rear of the building and progressing toward the foreground. A SHAW 180 ton overhead crane services all three services areas. As previously mentioned it will service any railroad's power. If you look close, (Real close) you will see a BNSF C44-9W in bay 3 and a DRGW steam Locomotive in bay 2. The steam locomotive is a 4-6-6-4 Challenger Type. Yep, we take on all kinds here. 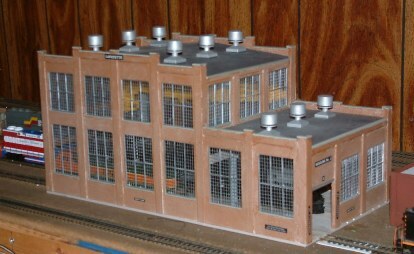 This is the North side of the Lafayette Engine Facility. Bay #3 allows for a pass-through track for the purpose of fueling those locomotive that are undergoing repairs or routine maintenance. Also visible in the rear ia a "Repair-in-Place (RIP) track, the wheel shop, and the diesel fuel tank that is under construction. The wheel shop not only services the locomotive wheels, but other freight and passenger car wheels as well. Depending on the condition of the wheel being corrected, they can be "turned" on a giant lathe to restore their proper wheel symmetry and contour. The South side of the service facility shows the "business end" of the building, and all three bays are open for business. A CSX GP40-2 number 6383 is waiting for entrance to bay 1, a Durham & Southern GP38 number 2000 is waiting for its turn in bay2. Southern Pacific's SD9 Number 5459 is waiting for bay 3. Clearly visible in the upper windows is the yellow SHAW 180 Ton overhead crane. It is presently without a load but it is capable of handling those locomotives that are awaiting service should it be needed. 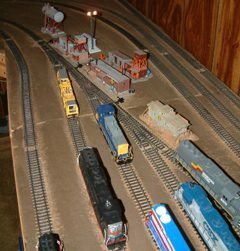 The Southside service trackage leading to the service facility is filled with several locomotives that have received or awaiting servicing. A CSX transportation's MP15AC Locomotive number 1145 is sitting on the 3 service track. In front of it is Durham and Southern GP38 painted in it Red, white, and blue "Patriotic" paint scheme. It followed many railroad in honoring the United States Bicentennial Celebration. The MP15AC is not awaiting Maintenance. It is stored at the servicing facility between switching assignments in the village. Once, the village trackage is completed, this locomotive will be stored there. Here is a "bird's eye" view of the south side service entrance trackage. From here you can see there are five service tracks. 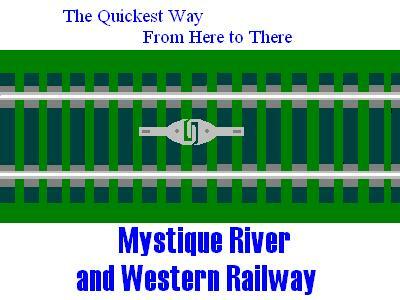 Counting from left to right, track number1 is the "Ready Track". Here locomotives are places when their service needs have been met and they are ready to go back to work. The "Ready track" also doubles as the locomotive's "programming Track". Track numbers 2 through 4 are service bay entrance tracks. Track number 5 at the extreme right is the "Repair In Place" (RIP) track. Here those locomotive (and cars) that need light running repairs are placed outside the building. This usually takes on repairs that need one day or less to complete. The Lafayette Locomotive Shop "Ready Track"
As previously stated, the locomotive ready track is the "Last Stop" before assignment to mainline or switching duties. It is purposely long to allow for "Limited Distance Running" in it's final checkout. 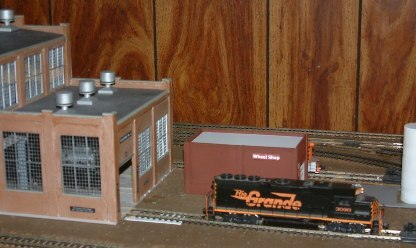 From the model railroad perspective, it also is the programming track for your Digital Command Control System. 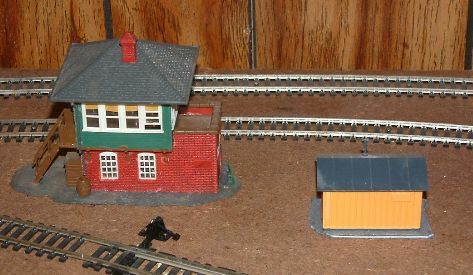 Once the track control switch has been moved from the "Run" position, the "Ready Track" is completely isolated from the the rest of the railroad. The "Off" position will not allow either locomotive running or programming. In the "Programming" position, the "Ready Track" is sectionalized whereby the programming section of the "ready track" is energized only by the Command Station's Programming facility. The remaining section of the "Ready Track" is completely dead and serves to furthere isolate the programming section from the rest of the railroad. The South Side Guardian - Tower "ST"
As the service building goes, Tower "ST" (also known as "South Tower") is not part of the Lafayette Service Facility. Yet it's job is an important one, as it controls access to the Lafayette Shop from the railroad's Eastbound and Westbound mainlines and the Village Service tracks. For that reason I've included on this page. 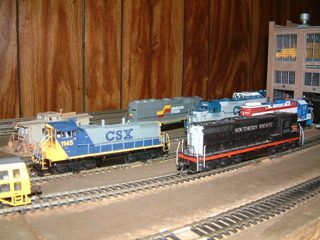 Keeping locomotives and cars in proper working order is just as important on a Model Railroad as it is in the "Real World." This is one of the aspects of the hobby that keeps it's participants active (and young at heart). While we may not have to struggle to lift a 16 cylinder diesel engine out of our models, we do need to keep moving parts oiled and motor brushes will have to be replaced from time to time. Wheels always seem to be need cleaning not only on locomotives but other rolling stock as well. Nothing is more embarrassing than to have trains that won't run or won't stay on the track when you have visitors to you railroad. Just like a real railroad, maintenance is always an ongoing effort. Thank you for visiting the Lafayette Locomotive Service Facility.